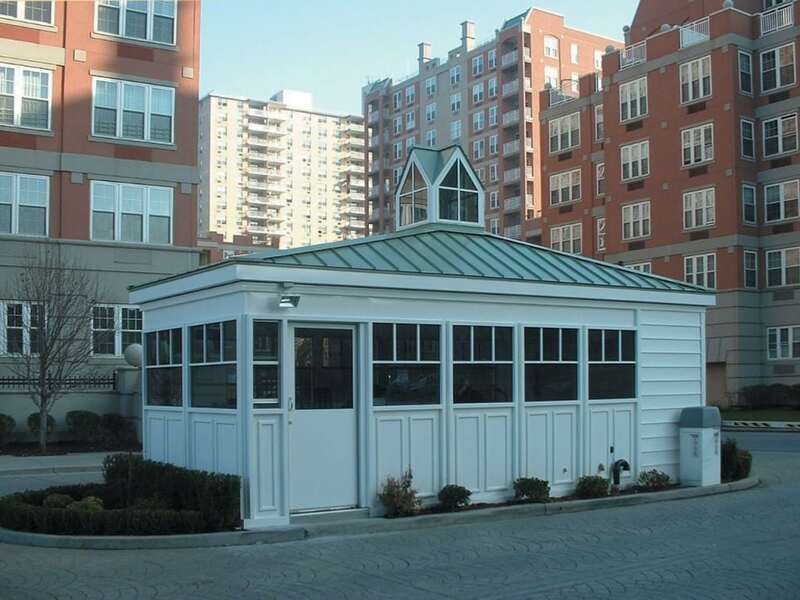 This Brooklyn community required a “built on site” appearance, with the advantages of a pre-fabricated building. While Par-Kut buildings are typically finished with our superior polyurethane coating over smooth galvaneal steel panels, the site architect here wanted to further compliment some of their location’s design elements. Accordingly, Par-Kut added decorative window frames and muntins, white vinyl siding, a hip style standing seam metal roof, bas relief panels in lower exterior walls, and a custom fabricated a cupola that would dimensionally fit the long, narrow building. The interior was equipped with painted steel countertops and cabinets for an efficient security office layout. Additionally, the building was furnished with a restroom and a separate utility closet. Fan forced heaters supply warmth in cold weather months and a split pack type air conditioner system provides cooling. Building windows were glazed with tinted insulated glass for further climate control.